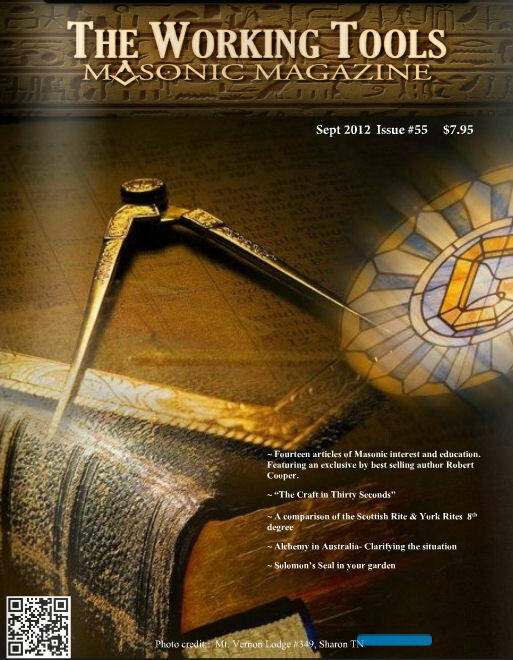 If you want to read a really good magazine written by Freemasons for Freemasons, you should check out The Working Tools Masonic Magazine. I've been enjoying that magazine for some time, and it's surprising sometimes just how great the content is. This month's issue features 14 contributors, including best-selling author Robert Cooper, author of Cracking the Freemasons Code and several other terrific books. The magazine has gone from an e-magazine format, to also being available by subscription in a printed version. You can even get it through the Apple Store now, too. Visit the website for subscription information. Every issue has a little something for everyone. I published a piece in the magazine about a year ago, and Michael Shirley and I published our first joint piece The Craft in Thirty Seconds in this month's (September 2012) issue. If you missed it--that was a shameless plug. But it's a terrific piece, and the only place you can read our article, is in this month's magazine. There's an interesting connection between the Working Tools Masonic Magazine and our humble blog, the Midnight Freemasons. Not only have Michael and I published in the magazine, but one of the frequent guest contributors to the Midnight Fremasons, Bro. Steve Harrison, has a regular column in the Working Tools Masonic Magazine based on his popular blog the One Minute Mason. You'll find Steve's posts here. And the editor of that fine magazine, Bro. 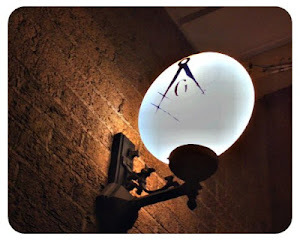 Cory Sigler, has also published a piece on the Midnight Freemasons--and I'm hoping he'll do that again soon. You'll find Cory's contribution here. And my understanding from Bro. Sigler is, that soon, another Midnight Freemason, Bro. Greg Knott, is going to publish a piece in Working Tools. You'll find Greg's contributions here. I always look forward to Greg's posts, because they always include a sampling of his photographic skills. One of the things I've really enjoyed in turning this blog into a contributor site is working with a lot of talented people--each with their own insights and areas of expertise. Judy Gordon gives us a perspective into Freemasonry through the eyes of a woman who grew up in the fraternity, is married to a Freemason, and is very involved with Job's Daughters. I met her and her husband Ray in Pekin, Illinois, not long after I published my first book. One of my first speaking gigs. I'm not that good at it--one of the few places that invited me back! And I brought George Washington with me! The Gordons and the Creasons have become great friends--sadly Reggie and Roxanne (our canine children) have yet to meet. Ray and Judy and been with me from the beginning of my writing career. I always tell people that Judy has sold more of my books than Amazon.com. And when I decided to form my own publishing company, Ray, a graphic artist, designed the Moon & Son Publishing logo that's on the spine of my books and the title page. My lodge is sponsoring a 5K charity trail run next week--Ray and Judy are coming to join us. And, of course, Ray designed the t-shirts. 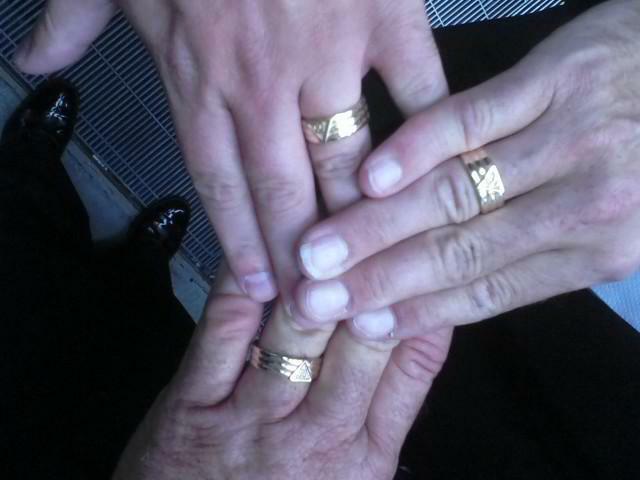 3 x 33-taken minutes after the ceremony. The Illustrious Scott Niccum, 33, can always be depended on for offering up pieces with great humor and huge heart--and that's a perfect description of Scott. We met after I joined the Scottish Rite Valley of Danville (IL) and last year, shared an "Illustrious" experience together in Chicago neither of us is likely to ever forget. He has been a great mentor of mine since I joined the Scottish Rite, but I'm careful about taking the advice he gives--he's often the guy that suggests things you definitely shouldn't do. So we're very much alike. James E. Frey, I don't know very well, but he impressed me early on. We're members of the same Scottish Rite Valley. We've crossed paths a few times, and I must admit, our few conversations together I have always enjoyed--he's a much deeper thinker than I am. I'm always the Dr. Watson to his Sherlock Holmes. He has a great appreciation for history and Freemasonry, and is a person that has gained a far deeper understanding of some aspects of Freemasonry that I haven't even begun to get into. Last fall after our Scottish Rite reunion, we had a conversation, and I was already thinking about turning the Midnight Freemason into a contributor blog, and realized, he might be somebody that might have something unique to share. When I decided to do this--I called him. And he's offered up some very impressive, and well researched pieces. I particularly enjoyed his two-part piece on The Masonic Philosophy of George Washington--which he researched and wrote at my request. Robert Johnson was the first person I invited to join the Midnight Freemasons. I got to know him when he read one of my pieces on his Whence Came You? podcast. We've yet to meet face-to-face. But his podcasts have become one of my favorite things. He's got a great voice, and he always finds material for his broadcasts that I enjoy. There's a link on the right-hand column of The Midnight Freemasons to the Whence Came You? podcast. You can listen to it right here as you read through the posts. You should check it out. He sent me the perfect gift a few weeks ago, for a Freemason that never knows when to go to bed (which is where the title of this blog came from). He made me a clock, and hand painted a square and compass on it. It hangs on the wall right over where I work--a constant reminder of the 24-inch gauge. Creason (left) and Knott (right). with you, Todd? I get that a lot. Greg Knott I've known the longest (more than twenty years) and we're members of the same lodge, went through about the same time, and have traveled together in this journey into Freemasonry. Our most recent project was chartering a new High Twelve in Champaign-Urbana (IL). The Illini High Twelve No. 768--a rousing success as the largest newly chartered High Twelve Club in the United States in the last decade. He's the Charter Secretary, and I'm the Charter President of that club. His travelogues are amongst my favorites--he travels, and he takes us along for the ride through his stories and photographs. Then there's my good friend and writing partner Michael Shirley, who I was introduced to by the Grand Master of Illinois at the time, Richard Swaney. He and I share a love of history, Freemasonry, writing, and Chinese cuisine. We're each good writers, but together on a single topic, we seem to compliment each others strengths and weaknesses. It's a rare thing to find a writing partnership like that. You'll be hearing a lot more from us. Article two is nearly finished, and the topic for article three is already planned. These are the contributors so far, but we're in our infancy as a blog. Our readership is growing. If you have something to offer, I encourage you--contact me. We've got some great voices early on, and I want to continue to build on it. Become part of the conversation. Join us.